We provide comprehensive treatment to all of our patients. We do not sell just an appliance, we provide treatment. Extraoral digital radiographs: panoramic view to see the jaw, a cephalometric view to see the airway and presence of obstructions such as hypertrophic adenoids, a Para nasal sinus view to check for nasal obstructions such as enlarged turbinates’ or soft tissue, and open/closed views of the temporomandibular joint to check for any predisposition to TMD such as pre-existing damage or excessive wear and tear of TMJ. Clinical exam: oral cancer screening, dental and periodontal exam, airway evaluation (checking any potential pharyngeal obstructions such as enlarged tongue, hypertrophic palatine tonsils, excess lateral pharyngeal tissue, enlarged uvula or soft palate, retro gnathic mandible, etc. ), maxillomandibular evaluation (size, vaulting of palate, tori, etc. ), TMJ exam (joint sounds, check for evidence of Para functional habits affecting TMJ health, muscle palpation), range of motion recording, and occlusal evaluation. Taking dental impressions and pouring up stone models to send to the lab. Bite registration in the appropriate position of the mandible as dictated by dental anatomy, range of motion, TMJ health, and patient comfort. Appropriate referrals are made to PCPs, dentists and dental specialists such as periodontists, otolaryngologists, neurologists, psychiatrists, or sleep physicians. 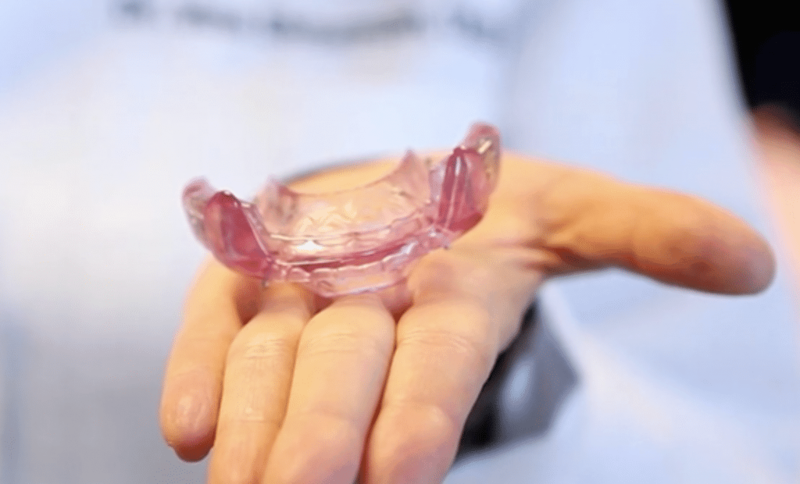 After the comprehensive oral evaluation appointment, the mandibular repositioning appliance (MRA) is fabricated by the lab. Then the patient comes in for a fitting appointment, during which we check the appliance intraorally for proper fit, alignment, and occlusion. Any necessary adjustments are made during that appointment. The patient is also educated about how to take care of the appliance, what new morning routines are needed to avoid TMJ problems, and oral hygiene instructions are reviewed. We also fabricate a custom morning repositioner device to prevent occlusal changes in the patient’s dentition. After that the patient comes in every 2-3 weeks for titration treatment. This time is necessary for the muscles and TMJ to adjust to each new position. After every two titrations the patient may be tested with a pulse oximeter overnight to check if blood oxygen saturation is improving. When titration is completed, the patient is sent back for a follow up sleep study with the oral appliance to check its efficiency. Very often our patients have Para functional oral habits (such as bruxism) that predispose them to having TMJ problems, so we have to provide even more care to those patients during the treatment phase (more frequent visits, working with them to address the Para functional habits, educating them about maintaining TMJ health, etc). After treatment is completed, our patients usually come in every six months for recall/maintenance visits, which may include overnight oximetry. During these visits, the dentist checks fit, alignment, and wear of oral appliance, addresses any relapse (if pulse oximeter results are worse than previously or if patient reports that their symptoms are worse), and checks the patient’s oral/TMJ health. Patients are also encouraged to see their sleep physician for regular follow-ups to make sure their sleep apnea is under control.